10 Ways to Increase Income for your Art Therapy Practice. Most therapists will earn their primary income from providing direct individual or group counseling. In addition to the direct earning method, there are a number of other ways in which a therapist can increase their income potential. 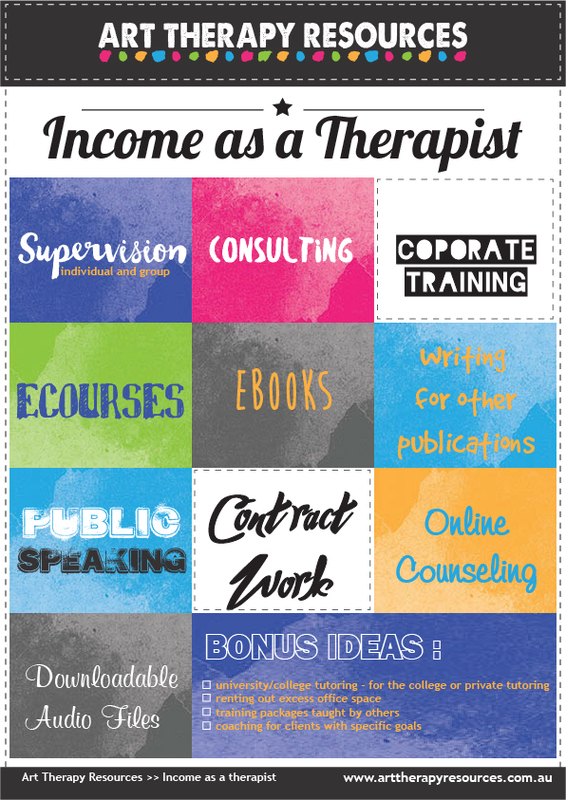 Finding alternative income earning sources is an important consideration that private practice therapists must consider. As a private practice therapist, your income is entirely dependent on your ability to provide your time and services directly to clients. This can be impacted if something happened to you such as sickness to yourself or a family member. Demographics within your regional area could change that impacts the type of clients that you usually help. Additionally, your interests may change over time with regard to providing therapy. You may also want to take some time off for a short or extended time period which will result in a significant drop in therapy session income. Having alternative income earning sources provides you with the flexibility to earn income outside of your core therapy service. Some alternative methods of earning income still require your time to provide services, however, you also have the flexibility of adding passive earning income opportunities. Passive income doesn’t imply you don’t need to work to earn income, instead, it means you can create one product once and then sell it multiple times. Your efforts would then go into marketing your product instead of repeating the same service. In this blog post, we’ve included a list of 10 ways to increase your income as a therapist. You shouldn’t pursue all of these avenues unless you have significant administrative help. Initially, you should focus on one avenue at a time and develop your content and delivery methods until they can provide you with a consistent level of income. At that time you can then move on to adding more alternative income earning opportunities. As you think about what methods might suit you, also try and see how some of the methods can be implemented in connection with each other. For example, you may write an ebook, which you can then turn into an ecourse, which you can then develop into a one day bootcamp as well as offer bonus audio files for purchase. One idea and one concept can be developed and delivered in a variety of ways. This provides you with an opportunity to fully utilise your content as well as provide alternatives options for consumers to engage in your services and products. Supervision – supervision can be offered to individuals or as group supervision. This earning method may require that you seek additional training which should be taken into consideration if you are looking for faster ways to increase your income. Consulting – businesses, corporations, government departments, and community organisations regularly seek external advice when developing internal or community policy. Networking at events and conferences can help develop important contacts in these areas. Training – similar to consulting you can develop training packages that can be developed to business or government interests. Community organisations may also benefit from training from a mental health professional on specific topics. Some large corporations have annual training budgets that they look to utilise each year. Ecourses – these courses are conducted online with less direct contact. Ecourses allow you the ability to upscale your course delivery to potentially thousands of people compared to the limited number of people that are taught at in-person events. Providing ecourses allows you to control the content and marketing efforts to reach as many people as you like who fit your demographic. Ebooks – ebooks can be sold through established marketplaces such as Amazon or through your own website. Large marketplaces such as Amazon provide you with access to an established customer database to market your book. Writing for online publications – writing for other publications can be a mix of paid and unpaid arrangements. For those that are unpaid, your benefit is usually provided in the form of publicity. For paid writing, you can earn $20-$200+ per article. Public speaking – you can earn income by speaking at conferences, community organisations, government departments and corporate events. Similar to training, many corporations and community organisations seek external consultants to provide speeches on specific topics. Contract work for other practices – you could offer your services to other practices that are looking for contract workers to cover the absence of one of their therapists for a specific period of time. This could include maternity coverage or carer’s leave. Online counseling – in addition to in-persona therapy, you can add online counseling services that are becoming increasingly popular. A number of 3rd party services provide you with the facilities to conduct online counseling. Online counseling services provide software that is secure to use to connect with your client. These services enable clients who may face difficulties in physically accessing in-person therapy. Audio files – audio files can be useful for clients who like to have access to therapeutic tools at any time. Examples of audio files that can be sold include meditations and relaxation focused topics. University tutoring – you could provide tutoring at various levels as part of the university or college staff such as lecturing, practical workshops or exam markers. You could also provide private tutoring directly to students. Coaching – therapy is often associated with people who are experiencing problems in life, however, some people are also looking for motivational mentoring to achieve a specific goal. This could include starting their own new business or embarking on a change in their life. As a therapist and art therapist, you could provide coaching services to help your client achieve their goals. Renting out your office – if you divert some of your time to other income earning avenues, then your office will become available which you may want to rent out to other therapists. You can keep this system organised by structuring your work week so that you work on your other income avenues 1 day a week and rent your office out for that specific day. Create a training package that can be sold and taught by other trainers in an organisation. SIGN UP below to download a summary list of the useful links and tips about increasing your income. You can also access this Evernote document which contains the same tips. You can save this note to your own Evernote. You can view the Evernote document even if you do not use Evernote.